What do tech giants like Microsoft, Cisco, Facebook, Google and IBM have in common with 100 startup companies in Greece? They shared a wall for a week this September, on the floor of the 83rd Thessaloniki International Fair, the most important exhibition event in Greece, and one of the most important events in Southeastern Europe. The 83rd TIF took place September 8-16, 2018 and its 283,853 visitors made it the most successful one in the last 20 years. The USA was the Honored Country at the 83rd TIF, where innovation and technology took center stage. Right next to Pavilion 13, where the USA delegation was hosted, Pavilion 12, or “Digital Greece”, was the home of the Greek startup scene. In more than 32,000 square feet the Greek startup community got together in a week of entrepreneurship, innovation, workshops, presentations, networking and exchanging of ideas and opinions. ”Digital Greece”, an initiative of the Ministry for Digital Policy, Telecommunications and Media, hosted over 100 startups and 20 entrepreneurship structures and funds. “I’ve gone around Greece over two years visiting startups, visiting incubators in Athens, in Thessaloniki, in Patras, in Giannena and one thing that I have been convinced of is that this is one of Greece’s great secret success stories with the fantastic entrepreneurial sector here” said US Ambassador to Greece Geoffrey Pyatt, when he visited the “Digital Greece” Pavilion. “As our Secretary of Commerce, Wilbur Ross said yesterday, we really believe that this sector — technology, high tech, knowledge-based — is one of the areas for further growth in terms of U.S.-Greece trade and investment” Mr Pyatt added. The startup scene is booming in Greece, with unofficial databases showing the number of startups between 600 and 1,100. The Greek government is trying to make registering a business easier and, along with partners like the European Investment Bank and the European Investment Fund, backs programs like Equifund, which will channel millions of dollars to Greek startups over the next years. “We consider it our obligation to support Greek start-ups” stressed the Greek Minister of Digital Policy, Telecommunications and Media Nikos Pappas while inaugurating the ‘Digital Greece’ Pavilion and added that youth entrepreneurship and new technologies could and should become Greece’s most important industry. Additional initiatives by the Greek government and the private sector aim to reverse the brain-drain, which has resulted in thousands of highly-skilled Greeks pursuing careers abroad. Meanwhile, the opportunities the highly-educated and highly-skilled Greek market offers have been internationally recognized from companies like Tesla, which recently announced plans for “Tesla Greece”, a new research facility in the country. 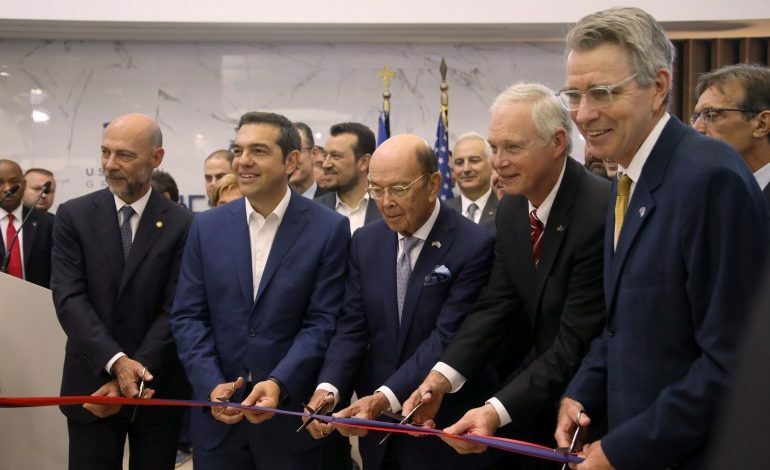 “Our decision to have such a robust presence here at the TIF demonstrates our confidence in Greece’s economic future as well as the desire of American business to be partners in promoting that future” said Secretary Ross in his message for TIF. This stamp of approval from the USA should encourage international investors to look at Greece for opportunities. It should also encourage the young, innovative Greeks to prove that they have the power to lead the recovery of the Greek economy.